A whitethroat bird, which every day sang from the same twiggy branch on the same bramble bush next to the Fife Coastal Path. Poppies and whitethroats, sea sounds and eider sounds, two sea eagles – one low over the Tentsmuir pines and the other climbing a blue spiral on a warm day, a dozen dolphins pounding the waves off Crail. And from sunrise to sunset, the pantiles, slates and crowsteps of St Monans fizzed with the high-octane fly-pasts of swifts. A week on the very edge of the land tugs heartstrings and plays on other emotions not so easy to identify, far less pin down. It was the fifth consecutive early summer, a week on the edge of the sea at St Monans, a pilgrimage among landscape ghosts, the ritual of an east coast mainlander born and bred who lives in the middle of the country and never quite learned how to shake off the summons of the east. The man has unfinished business on the North Sea coast and so, increasingly, has the writer. It was, in theory, a holiday and in many ways it was just that. There was more time for scones, more time for reading, more time for watching the sea change colour out of the window and just more time. But in practice, I never went out for a walk without binoculars, without a camera, without the nature writer’s antennae twitching at more or less every turn, without making mental notes; I kept telling myself “I should write about this”. In my previous life as a newspaper journalist, this was what I often used to do in my spare time. I would walk shores (and mountains and islands), look at the wildlife, try to bond with the landscape. When I became a nature writer for a living, almost 30 years ago now, the distinction between life and work began to blur, to the extent that now it has more or less ceased to exist. I was never a holidaymaker in the sense of flying to the sun. If I’m on a beach, it’s usually because there is no one else on it. It’s not that I’m antisocial, it’s just that if I’m working, my job demands a degree of solitary confinement. This St Monans week stretched a point – I shared the beach with my wife. Every now and then I wonder about somewhere like Sicily, just for the sheer novelty of a warm island. But I have never done anything about it. There is still time, of course but the inclination dims. On the Fife Coastal Path between St Monans and Pittenweem, there were whitethroats singing every hundred yards or so. It soon becomes apparent that their territories are very small indeed. 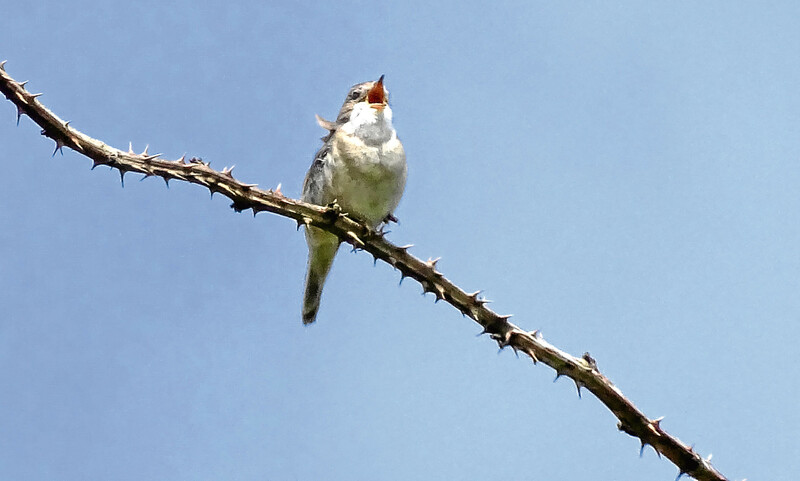 Day after day I saw the same whitethroat singing from the same twiggy branch on the same bramble bush. Taking its picture became a kind of daily ritual. If it wasn’t there when I passed, it was there on the way back. And oh the poppies. They throng the edge of the land in the kind of profusion that has become one of the natural world’s great rarities. Here, they insist on being admired for their beauty and their wildness rather than as a symbol of military commemoration. They are, first and foremost, wild flowers. They gladden the wild banks above the coast path and they glorify the edges and corners of fields of standing crops and they underline how little of wild nature in Scotland is so utterly and fabulously red. Into the midst of that most agreeable week came the news of Grenfell Tower. Like everyone else, we found it impossible to shake off that omnipresent image of the blazing tower then the blackened, haunted aftermath. But I had forgotten the healing balm of the edge of the sea, that its capacity to energise is matched by its capacity to calm. I leaned there often as the news grew daily grimmer. On the way west at the end of the week, on the way back from the sea to the heart of the country, we drove along the south shore of the Tay and stopped at Balmerino. It is hard to think of anywhere that means more to me than the particular prospect of the Tay from that shore. One of the services it renders to a native of Dundee is to show off the very finest aspect of its natural setting. It used to be that looking at Dundee from the south was to see a city grimly misshapen by the all-pervasive prominence of tower blocks. On that warm early summer afternoon I was struck by their comparative absence and by the fact that the most reassuring presence about the character of what my home town has become is the all-pervasive prominence not of tower blocks but of trees.